As the country's college graduates seek bright futures with rigorous job hunts, they invite a clear danger to their health when the offers come rolling in, as getting interviews means undergoing more X-ray examinations, according to a new report. Zhang Ming, a student from Shanghai University of Finance and Economics (SUFE), has been to four hospitals to have physical exams in a month. "The employment situation is not good this year. When there is a chance of being recruited by a company, I am very happy," Zhang said. He expects to get more offers from companies, and choose one he likes the best. However, to be eligible for these offers, Zhang has to face the physical exams required by different employers, and he cannot use one physical exam report with all his potential employers. Companies use their own designated hospitals, and before the last round of interviews, Zhang has to take a specific physical exam, after which he might get an offer. Zhang had two physical exams within three days in November, and on December 7 and 12, he underwent two more exams, each costing him half a day. In addition to fasting for blood tests, he had to get X-rays taken at each visit. Another SUFE student surnamed Wang who had undergone two physical exams including X-rays said, "We are asked to finish the physical exams before the final interviews, otherwise we are not allowed to participate in the interviews." Wang, also frustrated, added, "We want to get our offers and compare them with each other and then make a choice based on the salaries and details of the employers." Tan Yuxu, a SUFE employee who works on student employment, said that "90 percent of SUFE graduate students received two offers, and many have received more than three offers." Tan is happy to see students get many offers, but she also is worried about how the X-rays will influence their health. "Commonly, a person gets X-rays once a year, and they are having so many in a short time." 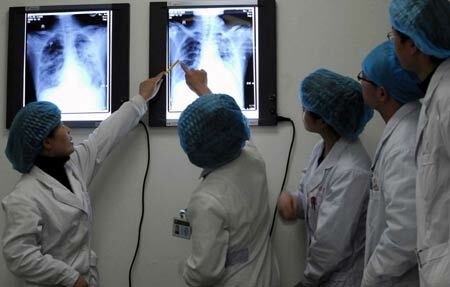 Liu Shiyuan, a professor from the Chinese Society of Radiology (CSR), said that frequent X-rays can impact human health. "If they are exposed to too many X-rays, the radiation can cause cancer and might influence their offspring." Liu said that a system should be established that allows for physical exam reports documented by qualified hospitals and physical examination centers to be accepted by all employers, and then a job seeker could submit copies of the physical exam report to potential employers. Employers argued that the current system, wherein candidates accept physical exams at designated hospitals, avoids fake physical reports and that they have the right to know whether candidates' health meets their demands. Labor law expert Hong Guibin said that there were no definitive regulations on physical exams, and agreed that there should be a unified physical exam system that considers job seekers' health and saving costs.